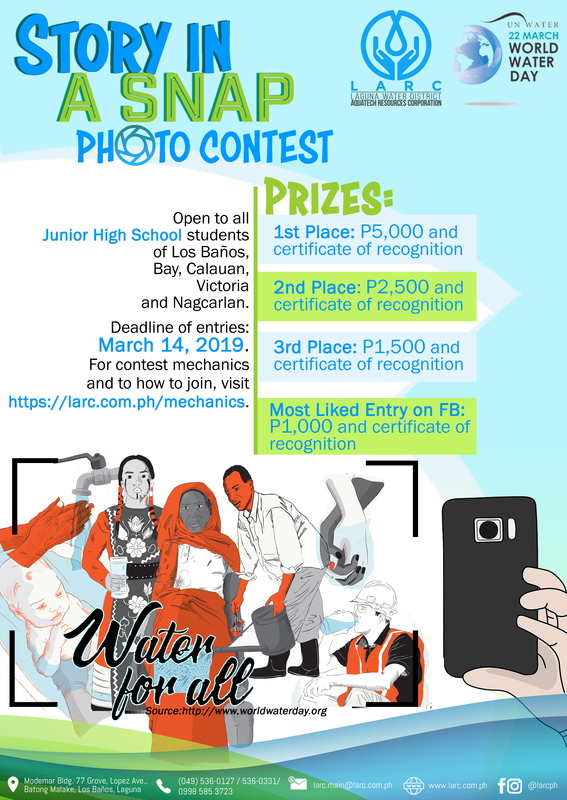 Contest is open to All students of junior high schools (Grades 7-10) within Los Baños, Bay, Calauan, Victoria (San Benito and Masapang), and Nagcarlan (Brgy. Wakat, Maravilla, Manaol and Banca Banca), Laguna. LARC and LWD Officials and employees, immediate family (spouse, parents, siblings, and children) and household members of those employees, are not eligible to join. Using a mobile phone, take a picture conveying the theme of the contest. The photo entry must be the participant’s original photo and not published previously nor entered in prior contests. Include a 2-5 sentence photo caption. It must be the participant’s original idea and must also convey the theme of the contest. Texts may be in English or Filipino and must be consistent with the language chosen to be used. LARC shall determine entry eligibility in its sole and absolute discretion. Entries must be in digital files submitted electronically in a .JPEG .jpg, or .png form. The photo files should not be larger than 25MB at the time of entry. Entries should include the complete name of participant, name of school, junior high school level, and contact number. All entries that will be submitted will become property of the LARC. The submission of entries is from February 14 to March 14, 2019, 5:00PM. The top 10 short-listed entries will be chosen by a set of judges and will be uploaded on LARC’s official Facebook page - Laguna Water District Aquatech Resources Corporation - LARC on March 15, 2019. FB users will have the chance to vote for their favorite by liking the photo of their choice until March 21, 2019, 5:00 pm. One like/react is equivalent to one vote and only the number of votes/likes of entries posted on LARC’s Facebook will be counted. Winners will be announced on LARC’s official Facebook page - Laguna Water District Aquatech Resources Corporation - LARC on March 22, 2019.